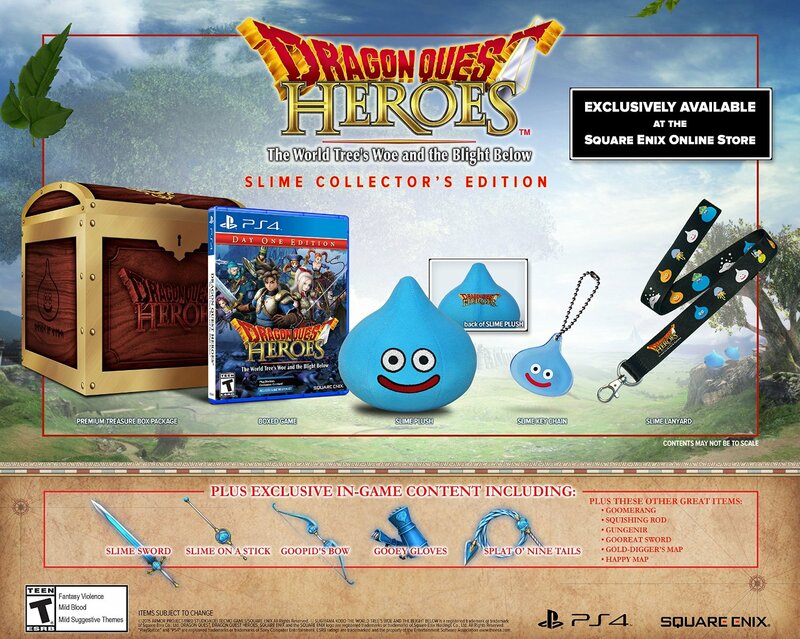 It looks like the Dragon Quest Heroes: The World Tree’s Woe and the Blight Below Collector’s Edition is no longer exclusive to the Square Enix Online Store. Multiple major retailers, such as Amazon and GameStop ,are now taking preorders for the premium version of the upcoming game. If you are interested, you can preorder the collector’s edition of the action RPG from Amazon.com with this link. For the uninformed, the Dragon Quest Heroes Collector’s Edition comes with a physical copy of the videogame in addition to a Slime plush, Slime lanyard and Slime keychain. All of the physical items are stored inside of the premium treasure box package. The digital bonuses include nine exclusive in-game Slime weapons as well as two bonus maps. The collector’s edition was originally announced as being exclusive to the Square Enix Online Store. So it looks like Square Enix decided to shift course recently. The regular and limited version of Dragon Quest Heroes: The World Tree’s Woe and the Blight Below will be made available on the 13th of October for the PlayStation 4. The game is the first of several Dragon Quest games being planned for the PS4 with the others being Dragon Quest Heroes II, Dragon Quest Builders and Dragon Quest XI.